Our work with artists of any age starts with the materials on hand. An open studio begins with graphite, color pencils, oil pastels. Some of our residencies were centered on laundry drying racks and construction flagging tape. Other residencies required a heightened awareness of light, photography, and words. An example of this was our legacy project created and designed for the Indianapolis Super Bowl Host Committee. All our projects begin with “meaning”. How do we make meaning out of our experience? It doesn’t matter how events unfold. What each of us takes away from our experiences is how we figure out what is most important to us. This is why materials are so vital to Theater of Inclusion projects – Everybody has to start somewhere. The arts give us a reasonable answer – start with what you have in your hands – what you can get a hold of – materials. This is the truly remarkable thing about the creative process – the art making process – the sense making process: Each of us works with what we have access to. There is a long-standing conversation about the value of some materials vs. other materials. For example: Gold leaf might be consider superior to egg tempera which might be considered superior to oil paint which might be considered to be – etc. But it really comes down to whatever works. Jackson Pollock took scraps of paper used for writing down catalogue numbers at the library and drew on them. Emily Dickenson used the backs of envelopes to write her poems on. What captures our imagination works. And, now and then, a project presents itself that requires materials that are beautiful long before you ever begin to work with them. Once such project is the stained glass double mosaic we are working on – “Nature as Teacher”. 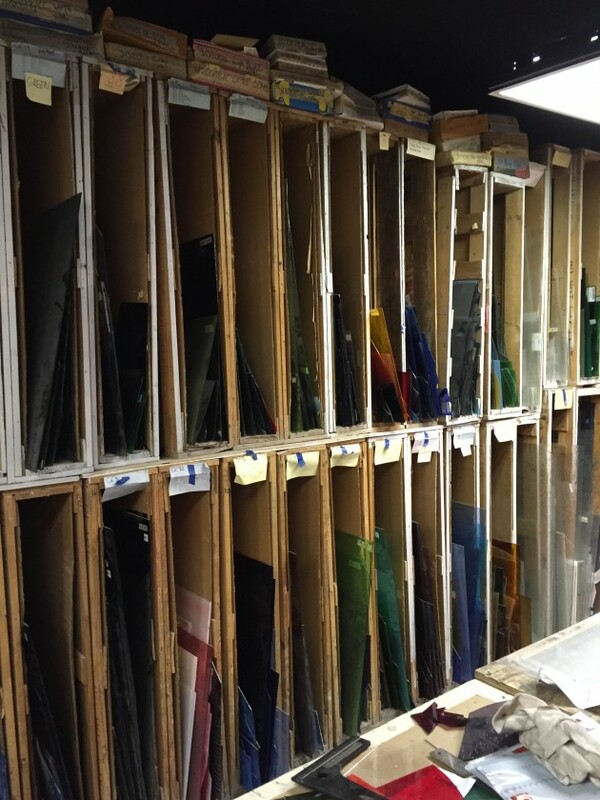 Brook Camden at Camden Stained Glass Studio has carefully guided us through the process of creating a glass palette for our mosaic. This image is a snapshot of what glass looks like before it is molded into meaning.